The graphic designer Stefan Sagmeister is now a kind of phenomenon. In recent months, he’s released a second book, mounted a solo exhibition at the renowned gallery Deitch Projects, and made a splash at Art Basel. And these are just the latest achievements in a career brimming with landmark design solutions and attendant accolades. All of which has been well-earned. His work is often breathtakingly ambitious in its understanding of what design can be. It takes a certain kind of ingenuity and clarity of vision to intuit that this profession can mean typography carved into human flesh, or charts and graphics rendered huge and inflatable, or hanging out the side of the Empire State Building. What’s more, his work also possesses a unique sense of whimsy that’s typically scarce in graphic design. Whether it’s a wall bricked with hundreds of bananas or a two actual school buses stacked one on top of the other, there’s a healthy amount of pure mirth present in most of his solutions — you rarely get the idea that he’s weary of his assignments, or that he’s doing anything less than having the time of his life. 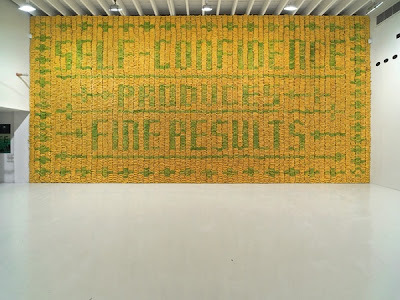 Indeed, one of the things that makes it so genuinely engaging is that Sagmeister seems to possesses an indefatigable willingness to act upon his playful ideas, to go to whatever lengths necessary to turn them into reality. Contrast that alacrity with the resignation of those of us who, if we can’t conjure up a solution in software or within ten feet of our desks, rule out anything more ambitious entirely. (Guilty as charged.) Via Subtraction 7.0.